Verrucas, otherwise known as ‘plantar warts’, are very common occurrences for many people, and are essentially a simple wart that appears on the sole of the foot. They seem to carry a stigma with them, but in fact anyone can develop a verruca regardless of their age, origin or hygiene levels. Verrucas are caused by a strain of the papillomavirus, which are naturally found on the skin of most people. When the skin integrity becomes compromised or damaged, the virus can enter the deeper layers of the skin and tissue and result in a verruca developing.The papilloma virus is the same viral strain that cause normal warts to appear, and as people continually walk on their feet and put pressure on their soles, the wart is forced to grow inwards instead of outwards as a regular wart would.As feet are often dry and have areas of cracked skin, they are very prone to these types of warts cultivating. 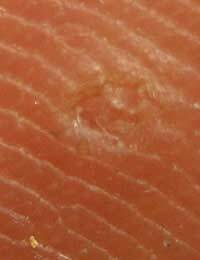 In adults, verrucas are often found only after pain is experienced, and commonly have a circular appearance of dry hard skin surrounding a softer central area, which usually contains a tiny black dot in the centre. They can spread and form groups of growths on the same foot each with it’s own centre.They are most often seen on the ball of the foot, which carries the highest levels of pressure, hence causing pain. Many supermarkets and chemists stock verruca treatments, which are often based on salicyclic acid or silver nitrate, either as impregnated dressings or within talc and aerosols; these preparations can prove useful for some, but for others they are an expensive commodity and it has been found that if the verruca is kept dry and covered, they may well disappear on the own within two to twelve months. There is also a wide range of cushioning plasters available, which not only help to reduce discomfort, but also act as a barrier between the verruca and the floor; these are often the best remedies. Doctors or chiropodists may want to treat stubborn or prolonged verrucas with freezing treatments but these are going out of fashion as researchers find that often no active treatment is better.Always ensure that it is definitely a verruca by checking to see if it has a central dot, as it may actually be a corn. For many people, there is no adequate prevention from getting a verruca. The best methods of prevention are to wear flip flops at all communal areas, as the infected skin cells of a sufferer of verrucas may be shed onto a hard surface floor when walking, and to ensure that if a verruca does develop, it is kept covered so as to prevent it spreading to the other foot, or to those around you. Verrucas are a common part of life and occur in many people. They are not a sign of poor hygiene and as research continues, findings suggest that often the best treatment is to let nature take its course and allow the wart to heal itself.